An ideal guide for engineers and technicians preparing for the National Association of Radio and Telecommunications Electromagnetic Compatibility certification program! 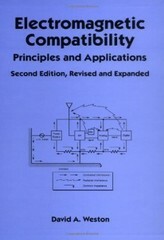 This totally revised and expanded reference/text provides comprehensive, single-source coverage of the design, problem solving, and specifications of electromagnetic compatibility (EMC) into electrical equipment/systemsincluding new information on basic theories, applications, evaluations, prediction techniques, and practical diagnostic options for preventing EMI through cost-effective solutions. Effectively demonstrating innovative techniques for on-the-job use, troubleshooting, and time conservation, the Second Edition of Electromagnetic Compatibility is an authoritative reference for electrical and electronics, circuit/system design, and radio and telecommunications engineers, technicians, and technologists, and an ideal text for upper-level undergraduate and graduate students in these disciplines.